Aspen Textile is ranked among the leading textile industries with a history of 2 decades of premium quality textiles. We have achieved this remarkable position by following our strong commitment to the top quality products & services. Our strong sense to adopt latest technical innovations is also a key factor of our vertical growth. Aspen is a respectable name in the international textile market for its commitment and responsiveness to customer satisfaction in high quality products & services. Aspen is an integrated structure of state of the art setup of machineries and highly skilled & experienced manpower. We produce complete range of textiles ranging from top quality fabrics to high profile made ups & textiles and export to Europe, South/Central/North America,Middle East,Russian countries. The blend of our most sophisticated tools, skilled & dedicated work force of over 500 employees and quality assurance system results in finest quality fabrics & textile products. Our slogan is “Excellence Without Compromise” we transform this ideology into reality by our Quality Assurance Department. Defining the proper strategies and planning of work is our first step to achieve goal and allocating & best utilization of available sources. 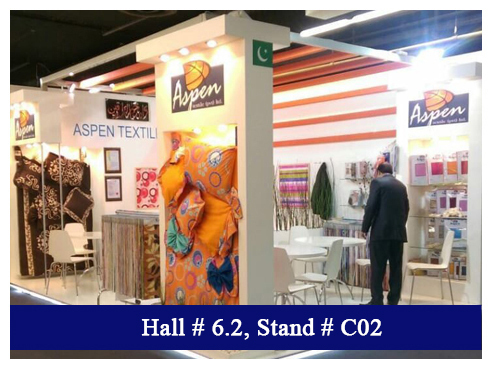 “Aspen Textile is ranked among the leading textile industries with a history of 2 decades of premium quality textiles. C-170 Ali Chowk, Dhuddi Wala, Jaranwala Road, Faisalabad, Pakistan.